I had the pleasure of speaking with Robert Pryor the Author of Lean Selling about how his new Book Lean Selling on how to apply Lean Methodologies to the Sales Process. Lean Methodologies have been the top way of process improvement over the last 50 years. One area that has so far been overlooks is the Sales Process, which like all processes can benefit from Lean Thinking. Sales is, or should be, a process and can benefit from Lean Thinking. Early adopters of Lean Manufacturing were very successful in taking market share from competitors it is likely that Lean Selling Organizations will likely enjoy significant competitive advantages for some time to come. So the question is whether sales people prefer No Decision or a No…? According to Robert’s research most prefer a No, because No Decision ends up being a long dragged out version of No with a lot of time spend on trying to “Save the Deal”….. or as I see it lots of Follow Up. It is far better to get the prospect to No and not spend any more time on a prospect that will Never Buy from you. That way more time can be spent on new prospects. Robert shared with us who the seller’s single biggest competitor is and will be, at least well over half the time, No Decision. That’s right, the number one competitor is always No Decision or Status Quo (aka, “Do Nothing”). It’s the biggest and most costly problem in the average sales cycle. Because a high percentage of buyers (as high as 70%) who enter the buying process and at the end, never buy anything—from anyone. As sales professionals, we have to engage both sides of the Prospect’s Brain. If we get hung up in the Left Brain logic of Specmanship, Quality Etc. we miss the more emotional Right Brain half of the Prospect’s Psyche and lose the sale. One side of the brain needs logical reasons to buy; the other needs to share the enthusiasm and emotional satisfaction with product. This is a major reason why so many “opportunities” go quiet. Buyers are unable to reconcile their right-brain and left-brain desires to make a decision. This means that we as sellers have failed them, because we didn’t provide them, or help them get by themselves, everything they required to make a decision. That’s why sellers can’t complain when a selling process goes nowhere, despite the effort they put into it. It’s often the inevitable result of thinking that we only had one buyer and didn’t see the other one that was hiding in that same buyer body. Why all this talk about Left and Right Brain thinking? It’s all about the buyer making a decision. The main goal of applying Lean Thinking to the Sales Process is to Speed it up. We all know, the sales process can’t end until the buyer makes a decision. We as Sales Professionals need to focus less on our product offering and more on what the Buyers Brain needs to make a decision. In effect, the Sales professional becomes a decision-facilitator for the buyer, drawing out both the right-brain and left-brain requirements. Often there are requirements buyers are not even consciously aware of. Then focus on how you can help the buyer get what he or she needs to make a decision. That way you will get more decisions and fewer no-decisions – the dreaded “Think It Over.” When you get more decisions, you get more sales. 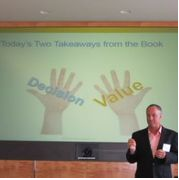 It’s the Sales Professional’s responsibility to get to a buying decision, not the Prospect’s responsibility. By focusing on getting, a decision and helping the prospect engage both their left brain and their right brain we can get to a Definite Clear Decision faster. By either getting a fast no or a yes we can shorten the sales cycle applying Lean Methodologies to get there. 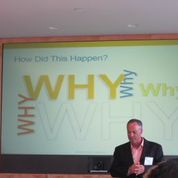 At the end of the Sales Leadership Alliance presentation, Robert provided ways people can learn more about Lean Selling. They can join the “Lean Selling” group on LinkedIn and follow us on Twitter @leanselling. There is sales process self-assessment in the book but it also available for free on the website http://www.LeanSellingBook.com. This simple 10-question assessment will tell you where your selling system stands compared to other organizations. This post is based on after the SLA event and personal conversations with Robert Pryor. Robert has been a sales, marketing, and general management executive in the computer and information technology industries for over 30 years. He was one of the early entrants into the commercial Internet industry, and a multi-time CEO in the Web and Internet space. For the last four years, through his business consulting company, CEO Cubed LLC, he has helped CEOs in a variety of industries benefit from his business experiences through close collaboration with them on how best to move their companies forward. For many years, Robert has been a student of the most popular selling methodologies and has occasionally had opportunities to train or coach organizations on these, in addition to implementing them in companies that he ran. This entry was posted in Product Manager Orange County. Bookmark the permalink.